As a kid I was a competitive cheerleader for 12 years, but after graduating high school I struggled to find the same passion I felt for cheerleading in my adult life. I went to college as a pre-med student and planned to become a veterinarian. My senior year in college I discovered Crossfit after my mom joined a box. I quickly followed and absolutely fell in love with it and completely changed my life plan. 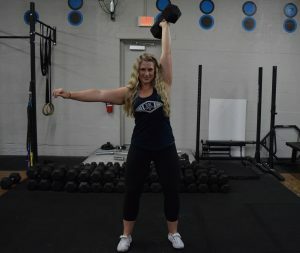 I graduated from college with a Bachelor’s Degree in Pre-Medicine, while achieving my Crossfit Level 1 in order to become a coach. I have a tremendous passion for fitness and especially Crossfit. I am determined to become an established athlete and aspire to be the best coach I can be to help others become healthy athletes at every level.